The perfect combination of size and performance, the Pentax 40mm f2.8 XS DA Lens is a lightweight, ultra-thin, prime lens with Pentax SP (Super Protect) coating to ensure optimum picture quality at all times. 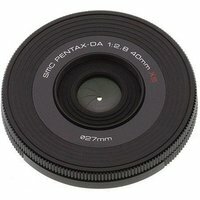 This Pentax KAF mount lens is compatible with current and past K-mount cameras and offers a focal length of 61mm (in 35mm film terms). This compact lens is equipped with a maximum f2.8 aperture which makes it ideal for low light photography, portraiture, and creative depth of field applications. Featuring a rounded nine-blade diaphragm opening, the Pentax 40mm f2.8 XS DA Lens ensures a natural, smooth blurred effect for elements of the photo that are out of focus.